Immunogen: Synthetic peptide corresponding to a portion of human caspase-3 . The sequence differs from rat caspase-3 by 1 aa and from mouse by 2 aa. Scientific Background: The caspases are a family of cysteine proteases that cleave after certain aspartate residues, and are primarily recognized as mediators of apoptosis. caspases are synthesized as inactive zymogens that can be cleaved to form active enzymes following the induction of apoptosis by stress or death receptors. Initiator caspases (e.g. caspase-8 and -10) are activated by dimerization of the zymogen on a dedicated adaptor protein. These activated initiator caspases in-turn cleave downstream effector or ?executioner? caspases (e.g. 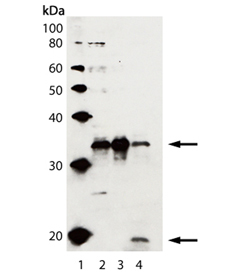 caspase-3, -6, and -7) in a cascade-like manner, which cleave key cellular proteins that lead to the morphological changes associated with apoptotic cell death.